Shooter is an enthusiastic herding dog who shows tendencies toward guardian nature. 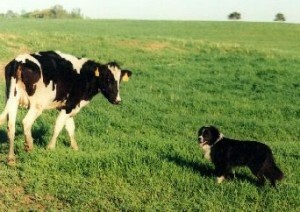 He is an extremely powerful dog, able to command 300 Holsteins in open pasture. What he lacks in herding style he more than makes up for with brains. Show him the goal and he will get it done. He loves the front end of a cow, but drives effectively from the rear in both chute situations and in pasture. Shooter is a very protective dog. No cow is allowed to approach his masters. He is especially protective of the children when they are near the stock. He has also warned several visitors with a low growl or nose bump when they approached his master from behind when master was unaware of their presence. Shooter will stand guard over a cow who falls in the barn, keeping all the other cows away and he proudly protects the kittens that are born in his dog house. He is the top dog on the farm and makes attempts to keep the other dogs out of harm’s way. Once you have earned his respect he will consider your command, but he will always defer to his master. He has a nose to rival a bloodhound and tracks proficiently. He has very little interest in chasing any kind of critter or moving object. Shooter is an independent thinker, capable of making good decisions without instruction or even his master’s presence. He is content to lie around until there is work to do. He is capable of great force and energy when the need arises.